Signs of support for Artie T. Demoulas in the Manchester store. Take one look at the Market Basket fiasco – employee protests that have essentially shut down 71 stores in Massachusetts, New Hampshire and Maine – and you’ll get a quick lesson in business communications 101. While Market Basket recently hired O’Neill and Associates, a crisis communications firm in Boston, the damage has been done. Communications specialists and grocery industry experts are in awe, watching a rapidly growing supermarket that was once valued at $7 billion drop in value within a week. The Market Basket saga will be discussed in the communications industry and business schools for years to come. When former CEO Arthur T. Demoulas was fired in late June, lack of a clear communications strategy was the start of Market Basket’s troubles, says Scott Tranchemontagne, president of Montagne Communications, a strategic communications firm in Manchester. “They were dropping the ax and trying to bring an end to a long simmering family feud in kind of a hostile takeover, so they should have realized from the get-go this was a crisis communications exercise for them,” says Tranchemontagne. Employee made poster of former Market Basket CEO Artie T.
How you say it is as important if not more important than what you say. Market Basket’s board of directors has remained behind a curtain, issuing press releases and printing an ad in the Boston Globe. Tranchemontagne says by not having a clear message or face to the Arthur S. Demoulas side of the family, it reinforces what opponents are saying about them – that they’re corporate, cold, don’t care about employees and are detached from employees and their customers. As are Market Basket’s press statements to tell employees to go back to work versus speaking directly to employees. Failing to communicate on a medium your employees, customers and especially your opponents are on is a big mistake as well. While employees and customers are on social media, sharing pictures of dogs with signs showing support for Artie T., Market Basket’s corporate side has been absent there as well. “When you know your opposition will be hammering you on a particular communications channel like social media, you have to play on the same channel,” says Tranchemontagne. Jayme H. Simões, president of Louis Karno & Company, a Concord-based public relations firm, said Market Basket missed a key point by never explaining from a business standpoint the rationale for replacing the management team and how they would make the stores function better. “Usually when you have a large corporation with thousands of employees you have an HR department that briefs managers and tells them how to speak to the employees in advance,” says Simões, who acknowledges that may have happened. But calls by NHBR to the Tewksbury, Mass. store and the Manchester store did not suggest any meetings had been held or that the information had gone down the chain to employees. One Manchester employee, who did not want to be named, said she first heard about Artie T.’s firing on the news. “And then we got letters in the mail from the new CEO saying if we boycotted we’d be fired,” she said. Bob McGeough, a consumer goods professional who worked in the grocery business for 30 years and as a vendor to Market Basket, says Market Basket’s hiring of new temporary co-CEOs Felicia Thornton and James Gooch was meant to intimidate employees. Ultimately new management figured any signs of dissension would fade as employees depended on their job. While Market Basket’s corporate side has only made poor communication choices, its employees have handled the situation beautifully, winning over customers and politicians. Simões thinks the fact that Artie T. has mainly stood back, allowing others to speak on his behalf, makes the message even more compelling. “Thousands of employees, customers and politicians [are] speaking out and saying this isn’t right,” he says. Employees protest outside the Manchester store. How the story ends for Market Basket depends on which option its board of directors chooses. As of press time, the board of directors had yet to make a decision on whether to accept Artie T.’s $3.5 billion offer to buy the company. 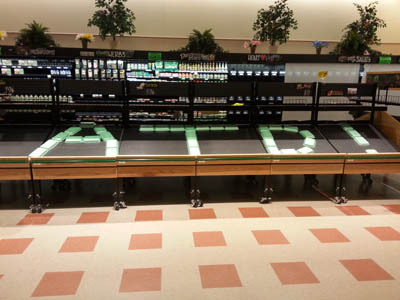 If Artie T. were to buy the company, many believe this story could be the greatest PR story for Market Basket, and the easiest route to solvency. Artie T.’s offer, $3.5 billion, is completely reasonable, says McGeough, especially considering the devaluation the past few weeks have caused. While the board of directors said they were still considering offers from six interested companies, McGeough thinks that may be a stretch as the grocer continues to lose value. If the company were sold to an outsider, McGeough says that any employees that were on the fence about protesting before would leave. But the customers will come back.